My library friends are no slouches when it comes to banishing winter! Today might have been the coldest Hoodie Hoo Day we've ever celebrated here at Thorntown Public Library. It was a whopping 12 degrees outside at noon sharp, which is when intrepid Hoodie Hoo Crew trooped out the west entrance to give Old Man Winter the what-for. I think they did a great job. Especially since I managed to nap inside, in the warmth, during the whole ordeal. Go away, Winter! I command it! PS - I have gotten lots of extra treats, cuddles, and tummy rubs in recognition of Love Your Pet Day. I guess this bunch is alright, after all. In January my library re-launched the Thorntown Writers' Group. This group meets once a month on the third Thursday. They can bring in stuff they've written on a pre-selected topic, or they can write a poem, or a journal entry, or whatever. It's all very easy-going and open to writers of all experience levels and interests. February's writing prompt is "12 Milestones of My Life" and the Thorntown Writers' Group is scheduled to meet tonight. Now, the best thing about being a Blogging Library Boss Cat is that I've recorded my Milestones as they've occurred! (Well, that's not really THE best thing, but it's a great thing!) So I decided that I would do a super special Throwback Thursday and recap the 12 Milestones of My Life. . . so far. These are in Chronological Order. October 19, 2008: I was Found. This is the only Milestone for which I do NOT have a blog post--because I did not yet have a blog! I was found by Karen Niemeyer, and she decided to take me home with her. Unfortunately, AAB Karen had a couple of noisy weiner-dogs and some other cats that I didn't much care for--but even hiding under a bed is better than being left Outside and not having a home. Each year we celebrate my Finding Day on October 19. I wasn't yet a Library Cat, but I was Found by the right person. That makes all the difference. December 31, 2008: I moved out of my office and into the library. When I first took the job as Library Cat, I was confined to one office. My staff wanted to make sure that I got acclimated to library life and wouldn't go around doing Bad Stuff. (!) It was actually nice, because I got to know my office-mates really well, and it gave me a nice home base once I had the run of the place. After a while, I was allowed to roam the library in the evenings, and, once Karen realized that I was ready to be Boss Cat, I was able to patrol my library full time. February 23, 2009: The last time I ever wore a Collar. Cats, for some reason humans have a hard time resisting the urge to make us wear things. We already have our furs, which is sufficient--if you ask me! Obviously, if you're a Sometimes-Outside cat like Summer, you'll need to wear a harness to stay safe & sound. I am an Inside-Only cat though! I was so Mad about my stupid Collar (R.I.P.) that I sat in my toilet box in protest. I have never, ever had to wear a collar since that day. June 15, 2009: I defended my Library and vanquished an Enemy. Librarians are cowards when it comes to stinger-bugs. There, I said it. You always suspected it, but you could never be sure. The one exception to that rule in all the history of libraries was AAB Chris, NOT to be confused with AB Christine, Queen of the Wusses. AAB Chris and I worked together to smite a nasty stinger-bug that was drifting around the library windows, striking terror in the hearts of visitors and staff alike. I was awesome. I learned what a Brave mancat I had become that day. July 25, 2009: The Fire Alarm Test. Every year these harmless-looking men come to my library, look around in closets, push weird plastic-tipped sticks at the ceiling, and make sure the ceiling things with the blinky lights work properly. (These, I learned later, are smoke detectors.) That part was fine. . . but after the poking and looking, they turned on the fire alarms. It is the worst noise in the whole world, even worse than the sound of a toddler screeching, "Look mommy, a KITTY!!!" from two feet away when you're in the middle of a good nap. Now we have a special "Fire Alarm Test Cat Ear-Saving Procedure" that goes into effect whenever those harmless-looking men with the weird sticks show up. April 28, 2010: I got Put Outside. This was the worst day EVER. The only really bad thing about being a cat (well, sometimes) is the smallness. When people decided to Upside-Down you, they just do it. When they decide to move you to another chair, they just do it. When they want to stab you in the rear-end with a needle, they just do it. When they decide to put you Outside, they just do it. The People-Counter-in-Training who put me out ended up being a very Nice man who thought he was doing a nice thing. He even brought apology treats. (I accepted.) After my accidental Putting Out, my AAB made special "We have a cat, don't put him out!" signs to post at all of the library's entrances. I have been Inside ever since. October 16, 2011 and June 4, 2013: Other "Library" Cats. Many of you will remember Not-Tober and Dumb Smelly Kitten. These were two Intruders who (briefly) lived in my library and (briefly) stole the hearts of my staff. Not-Tober was brought to the library by a man who thought he was ME! The Imposter stunk up my office with his Not-Tober smell. Worst of all, he number oned AND number twoed in my box! A few years later, Dumb Smelly Kitten showed up and played with all of my toys Feline Training Devices. As much as I do not like to share my space (or food, or litter pan) with other cats. . . I'm glad I have such a sharing, caring Library staff to cater to my every whim. November 8, 2011: My Finding Day Poster Contest. My Poster Contest was announced on October 2, 2011 in honor of my Finding Month. I had all kinds of submissions! Seeing that so many library and blogging friends took the time to make a poster in my honor made me feel very Loved. My blog now has an Art Gallery where I've posted all of the arts that have been created in my honor. April 17, 2012: Toberscapes. I was the centerpiece--heck, I was the whole theme!--of a decorated Tablescapes table! Tablescapes was a fund-raiser to support The Women's Fund of Boone County. My table had a Tober-sized statue, a Betta fish in a fish-bowl, Goldfish crackers, Feline Training Devices, and Tober placemats. It felt very special (and fitting) to have a Tablescapes table designed in my honor. March 14, 2013: B Magazine. The Lebanon Reporter, our local newspaper, decided to revive B Magazine in 2013--and they chose me to be on the cover! (AAB Karen got to be on the cover, too, since someone had to hold me up.) The magazine had lots of great stuff about Karen and about the library, and some downright awful stuff about me. (It said I was "jokingly" referred to as Boss. . . what's that all about?) I was pretty mad with Karen, who also called me "spoiled" in the course of her interview. Traitor. Oh well--no such thing as bad publicity! November 30, 2013: Calendar Cover-Cat. This was the biggest news in the history of the Thorntown Public Library--and that's saying a lot! 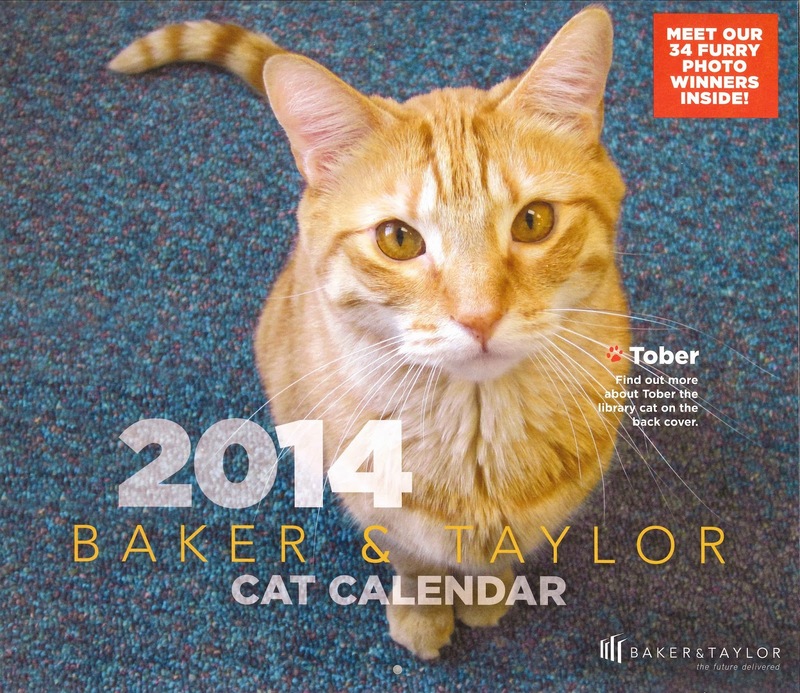 In 2014, I was chosen to be a Cover-Cat for the Baker & Taylor Cat Calendar. I mean, it was an obvious choice. I am handsome, with nice glowing furs, downright magnificent whiskers, and a penetrating, golden gaze. I stare into your soul. I make you wish you could work at a library--especially this one. Still, it was so cool to know that I was on the cover of 16,800 calendars with a worldwide distribution! So that is my list of 12 Milestones of My Life. I think this was also one of the hardest blog posts of my life! There are so many other things to include, like my Finding Day parties, my first Festival of the Turning Leaves/Book Sale/Carpet Cleaning/Mess Week, my Special Girlcat, the time I accidentally declawed myself. . . I hope you've enjoyed my Throwback Thursday x 12 as much as I've enjoyed remembering what a wonderful, exciting adventure I've had as a Library Cat! I was recently informed that February 20 is Love Your Pet Day. 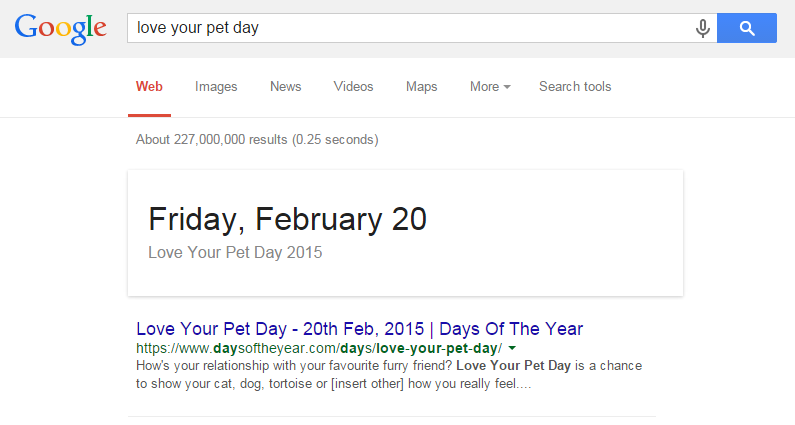 Astonishingly, I have never heard of Love Your Pet Day. Which is odd. I mean, yes, I'm a Library Boss Cat, but believe I should also have all of the rights & privileges of a Pet. I have been a Library Cat/Pet for SIX February 20ths, and never once have I had special treatment for Love Your Pet Day. No cards, extra treats, party hats (thank goodness), or other special recognition for being a Pet. Do you know what they do here for February 20? Hoodie Hoo Day. Yup. Hoodie Hoo Day. Instead of honoring me, a Beloved Pet and Library Boss Cat--they all run outside at noon, flap their arms and hoot and fuss at winter, and then rush back in the building to warm up with cake, pink lemonade, and ice cream. I know that banishing winter is important and all, but so is Loving Your Pet. Punxsutawney Phil said it would end. . . eventually. SO: I hereby declare February 20 Love Your Pet Day at Thorntown Public Library! My staff humans have ONE WEEK to get their acts together. I'm pretty sure that AAB Karen has gone on Vacation FOREVER. I threw her name-thingie on the floor in a fit of angryness. Her desk is nice and un-messy, which is really, really weird. Spooky, even. I know that this is the time of the year (cold, snowy, miserable) that she normally goes on Vacation for one week. One week is unauthorized, but still tolerable. You guys, she has been away for almost TWO weeks. That is forever. Breakfast and supper and litter-pan scoopings are still on time, thank goodness for small favors AAB Becki, but the treat distribution is terrible now that Karen is on Forever Vacation. AAB Kathy gives them to me THREE at a time. AB Christine makes me reach into her hand for them! Man, I hope she comes back before I waste away.